Ever heard of a place that moved countries? Well, the town of Colmar, in North-Eastern France and on the border with Germany, is one such place. Imagine a place with cobblestone streets running next to canals that are lined with absolutely gorgeous half-timbered houses, accentuated with quintessential French shutters and colored in various pastel shades of sky blue, rose, lemon, apricot, peppermint and many more! 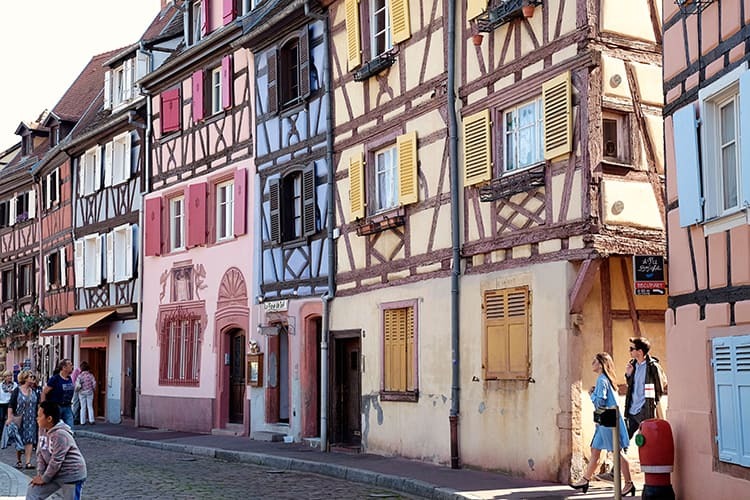 It is one of the most beautiful villages in Alsace, France, and one that you should include on your upcoming holiday to France, using our tried and tested Colmar guide of course! 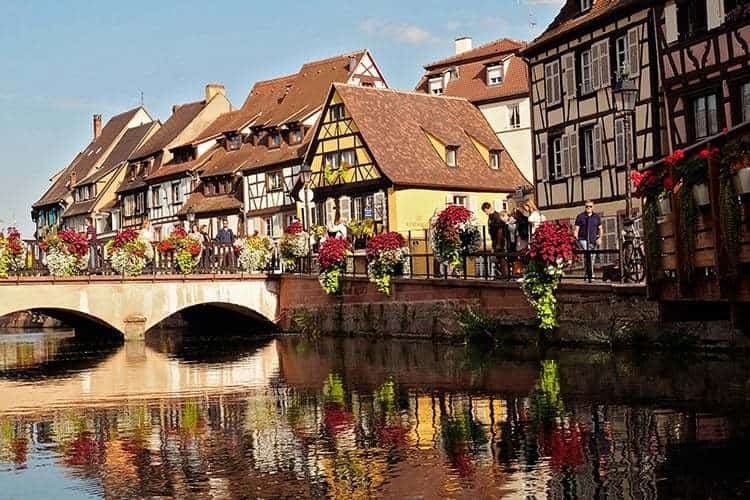 Located on the border of France and Germany, near Switzerland, Colmar is a fairytale French town that offers a mesmerizing insight into the last 1,000 years of European history. Colmar is located in North-Eastern France, next to the mighty Rhine River and on the border with Germany. Colmar is an extremely gorgeous little town in the heart of Alsace, a French region famously known for its vineyards and wonderful wines. 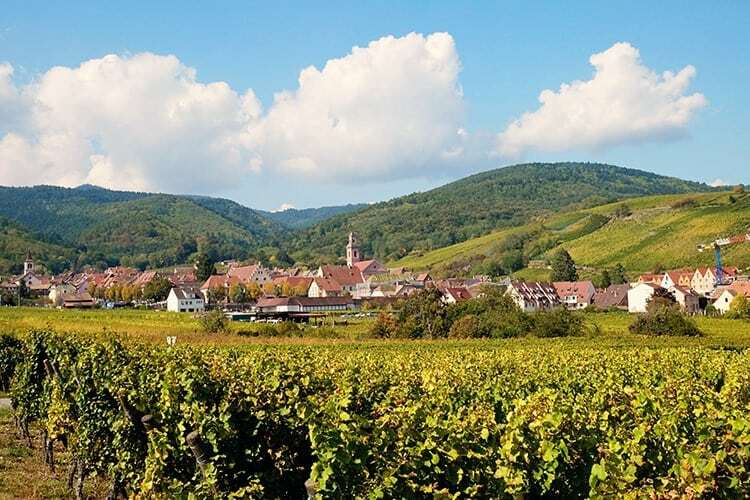 Ask anybody familiar with this region and he/she will tell you that Alsace is the world’s pioneer of wine tourism. However, Colmar is pushing this even further, but more on that later. How to Get to Colmar? 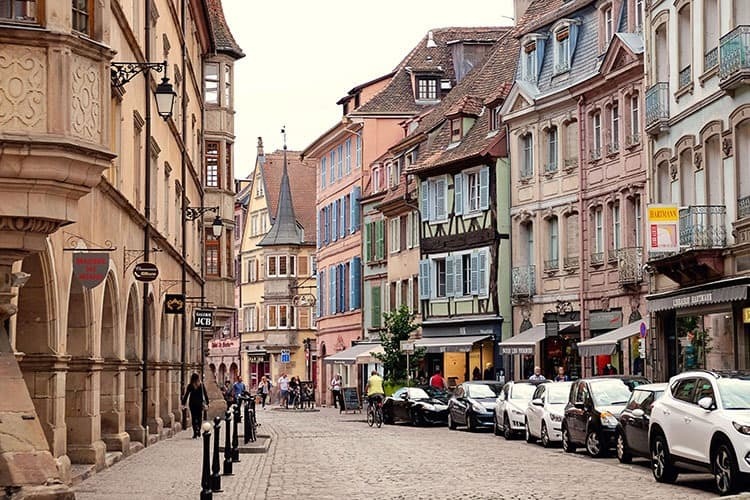 Set somewhere between the French cities of Strasbourg and Mulhouse (home of the Musée national de l’automobile, an automobile museum), you can find a direct train connection to Colmar from both cities. Sidenote: if you are coming from Strasbourg, which is 35 minutes from Colmar, make sure that you sit on the right side of the train and enjoy the highly captivating and stunning views of the Vosges Mountains. Alternatively, if you are coming from the German side, you can choose a bus near the border town of Breisach. Again, you can take a direct train from Freiburg and get a RegioElsass Ticket, which is way cheaper and valid for the bus from Breisach. Additionally, there a numerous low-cost flights from the closest airport, the Euroairport in Basel. Other airports in the area include Baden Airport, Zurich, and Stuttgart. 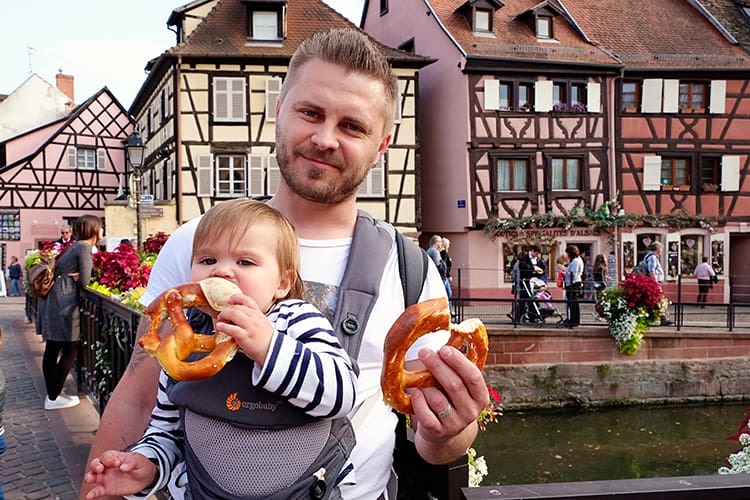 Here is a video to show you how stunning this Alsace city really is. Love our videos? Click here to quickly subscribe to our channel! A Tour through Beautiful Colmar in Alsace, France! Wondering what to do in Colmar Old Town? You could easily fill your days with this beautiful Old Town as it is pretty large in size. For the last 70 years since the end of WWII, Colmar has remained a permanent part of France, albeit with a hint of German architecture and culture. 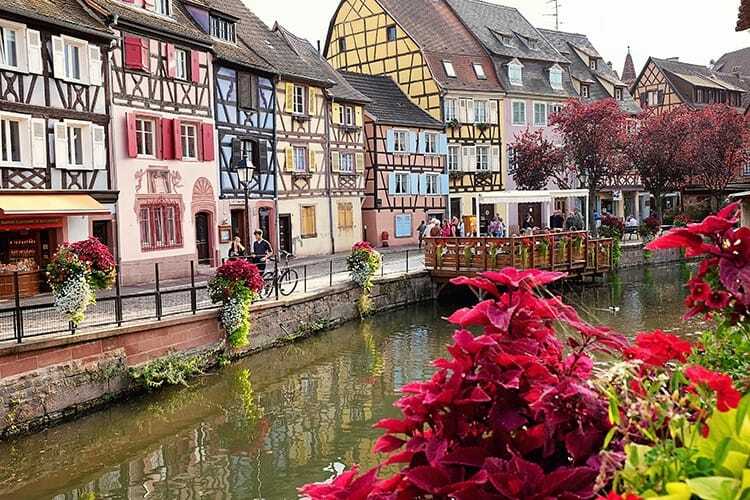 But more important than its Franco-German features is that this region’s stunning mountainous scenery shelters a gorgeous city, with idyllic villages, superb vineyards and wines, fascinating museums, cuisines, restaurants and of course, Colmar hotels. This is a little town of just 67,000 inhabitants, with a remarkably exceptional heritage, romantic canals and streets, sumptuous cuisines and wines, and even a dialect that is unique only to this town. It’s definitely a town worth visiting; a place where you’ll find the serenity and intimacy of a medium-sized town, but stand the chance to bump into various amazing things, scenes and magical architectures reflecting 1,000 years of strange French and German co-existence and struggles. It may be quite hard to believe this but the truth is; old town Colmar France is so attractive that it doesn’t feel real! It’s one of those few places in the world that you can visit and ultimately feel the urge to remain there for the rest of your life. 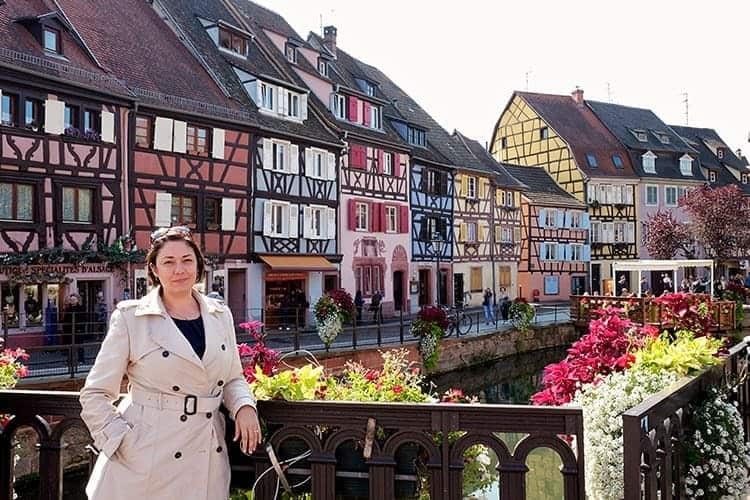 We have traveled to various parts of France and the world in general, but there’s no other place in this country or anywhere else, where myself (or any other visitor, for that matter) can be given a more genuine warm welcome, than in Colmar. Colmar dates back to the 14th century. This ultimately unique place has changed hands numerous times over the centuries between Germany and France. This is perhaps one of the main reasons why it has maintained an irreplaceable and fierce character that never conforms to any specific country. To drive this home, this is a place where a unique dialect is a commonly spoken language. 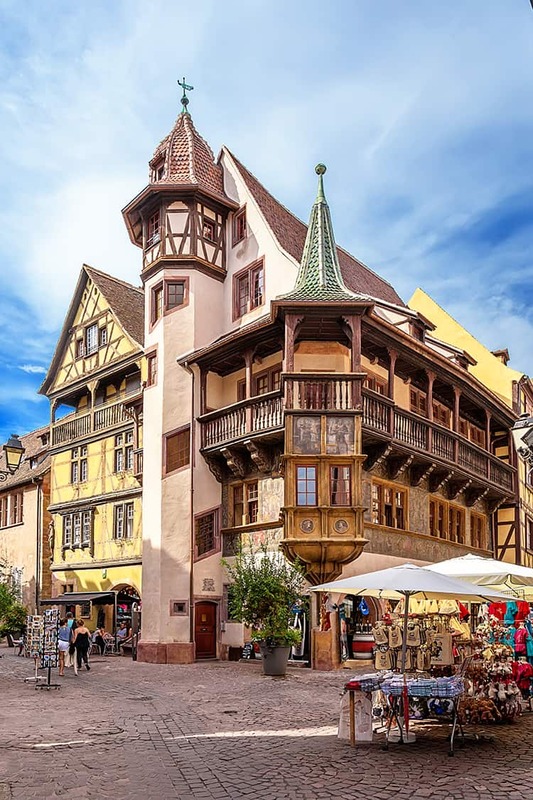 The best part of Colmar’s history is the fact that its centuries-old buildings have seen it all, but still remain beautiful and in tip-top shape. 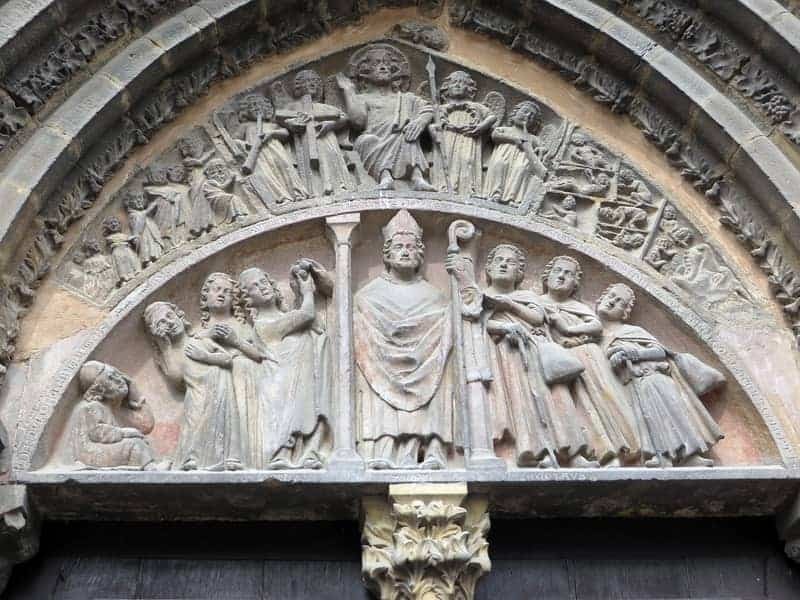 This town began as part of the Holy Roman Empire, but for the last 800 or so years, it has been governed either by France or Germany, with Sweden also enjoying some few years of rule. France took its control in 1673 but was overthrown by the Germans in 1871, only to be returned to France after the WWI. It was again taken by Nazi Germany in 1940, and was returned to France in 1945 where it remains to date. Forgetting for a moment Colmar’s magnificently eccentric history, this little old town also has many attractions and an indisputable charm, so many activities in fact that it would be impossible to visit them all in a day. Take a cruise on one of the flat-bottomed boats plying the lovely canals, while meandering under gratifying little bridges and alongside romantic, picturesque streets. 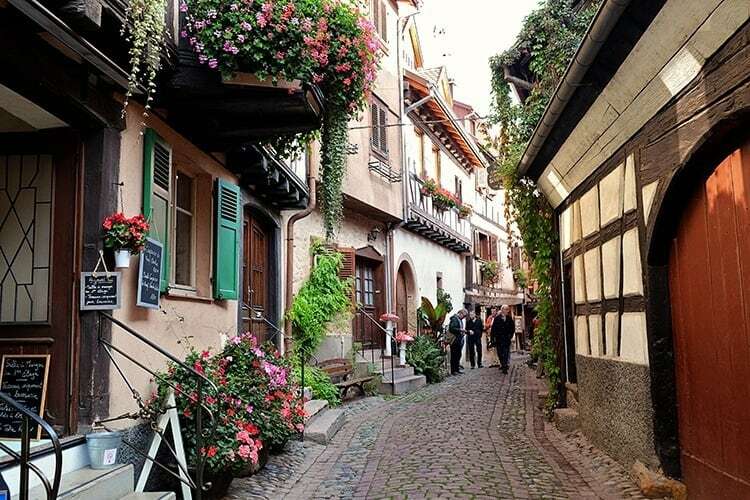 Walking down the streets of Colmar is reminiscent of visiting a captivating movie set full of century-old, half-timbered buildings that are conspicuously Germanic, yet with elegant French finishes, like in the critically acclaimed Disney movie, Beauty and the Beast. In essence, you’ll never remember that you are in France if not for the croissants and pain au chocolat from the bakeries. This is because Colmar is an architectural goldmine full of renaissance sentiment, gothic churches, and baroque mansions. While there are various places to visit, such as the Maison des Tetes (House of the Heads), Unterlinden Museum, Bartholdi Museum (in memory of Colmar’s famous son, Frederic Auguste Bartholdi, who designed the original Statue of Liberty in the U.S.), the main point of attraction is the romantic and world famous district of Petit (Little) Venice, near Quai de Poissoniers. This picture-perfect district, named after Italy’s Venice, will surely be great for snapping photos to fill your Instagram feed with, and that’s why you should carry an extra memory card just in case the first one gets full. Like the rest of Colmar, Little Venice dates back to the 14th century and has survived wars and annexations unscathed. Legend has it that it was a quarter for the old merchants, including butchers, tanners, and fishmongers. Otherwise known as the Église Saint-Martin, this fantastic Roman Catholic church is a wondrous attraction in Colmar. The building holds hundreds of years’ worth of history. Stepping in through the Saint Nicholas doorway gives you an immediate view of how spectacular the design of this church is. The interior is decorated with colorful tiles, including a pattern of red and gold ones that form the shape of the Latin cross. The High Gothic Choir contains intricate 15th-century stained glass and carved wood details. The stained glass windows add to the ambiance of the church, which is completed by the antique Baroque organ. While on the outside, an assortment of medieval sculptures stands to greet incoming visitors. This magnificent building is almost 500 years old and holds much of Colmar’s artistic history both on and inside its walls. The paintings are all displayed on the walls of this magnificently built house. You’ll find scenes depicting biblical scriptures, as well as portraits of German emperors. Stroll down Rue des Marchands street, which is the home to this house, and step outside to get some amazing photos of the decorated facade. Unfortunately, the house is not open to the public, but the view is the best from outside, anyway. 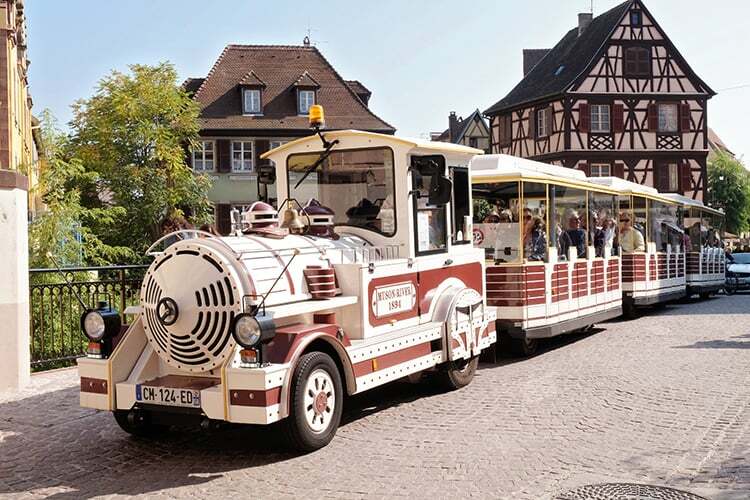 There are two trains that take tourists through Colmar, the Green Train and the White Train. They both offer scenic rides with live commentary in many international languages. This is definitely one of the most fun, informational ways to see Colmar. An exciting trip down the gorgeous streets, with a friendly conductor just bursting with knowledge to share with you! One thing you shouldn’t miss when in Colmar is enjoying the Alsatian wines on offer. There are a number of vineyards in the surrounding villages outside Colmar. You can arrange a guided tour, or simply take a drive out yourself. Visit the wine farms and taste their delectable wines. 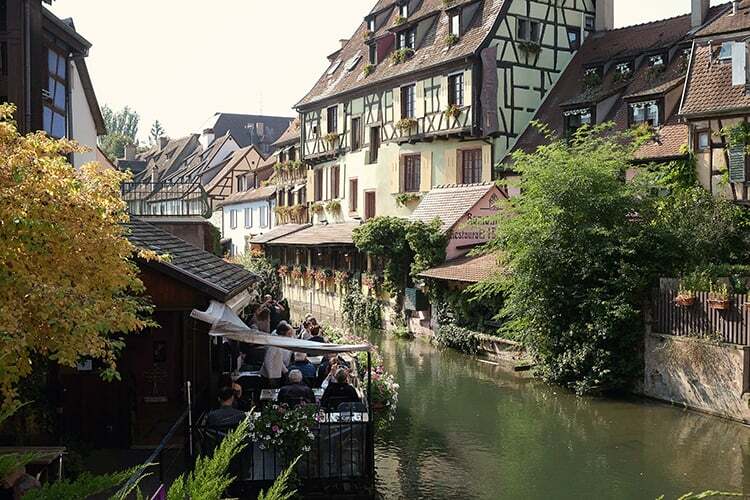 Depending on when you arrive, and how long you plan to stay in Colmar, you may even be able to attend one of the many wine festivals held throughout the year. There is accommodation along the route, as well, if you would like to make it a longer trip. If you have kids with you, this is sure to be a favorite! Even if you don’t, though, adults are likely to enjoy this just as much. Housed in an old cinema, and displayed over 3 floors, the museum is home to a collection of toys dating from the 19 century to the present. See how toys have changed over the years, and which ones have managed to stand the test of time. From the outside, this market hall may not look quite like a market. With the brick and steel construction, it’s sturdy and durable. Inside, however, is a bustling covered market. 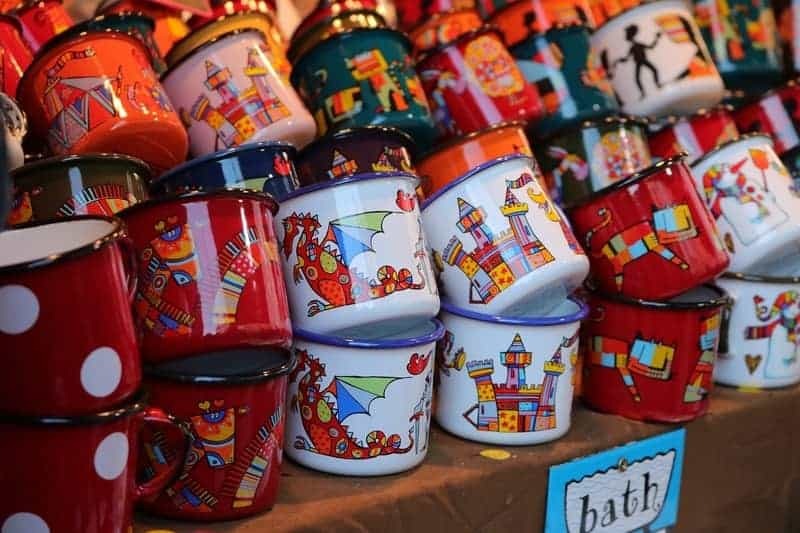 Made up of around 20 vendors, selling everything from food to clothes, and memorable Colmar souvenirs. Grab a deliciously authentic Alsatian lunch from here. In short, Colmar is generally an enchanting maze that illustrates Alsace’s unique culture, historic leather-tanning district, brightly painted half-timbered houses and amazingly interlocking waterways. 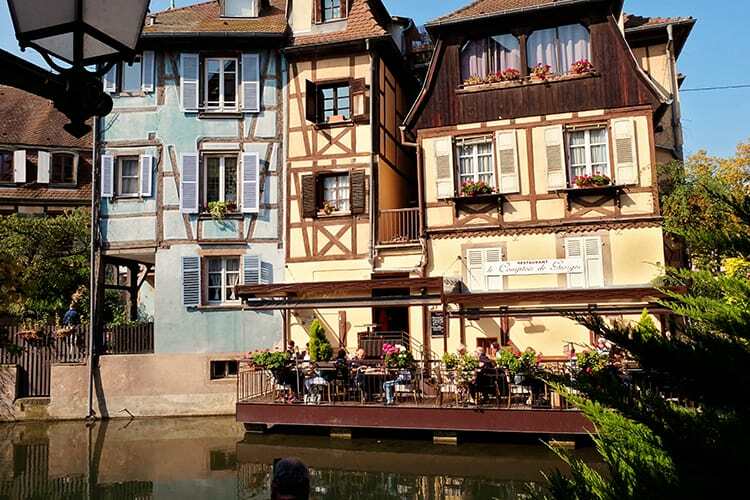 From boat rides, mountain climbing and bike rides, to hiking and fishing, there are a lot of things to do in Colmar to suit all tastes and preferences. 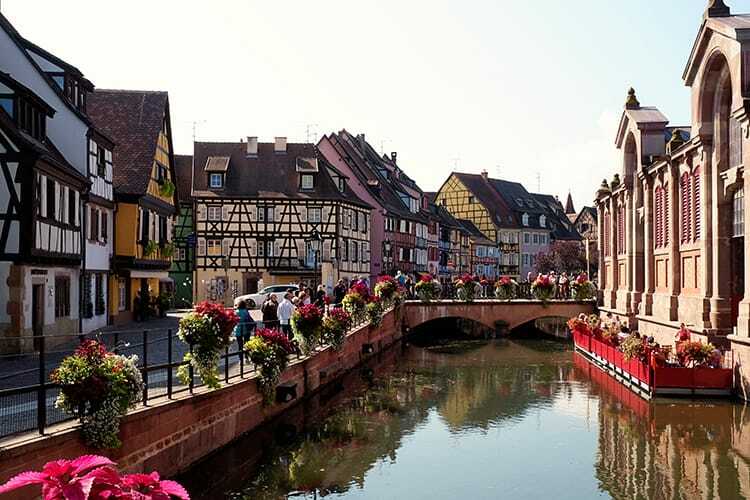 Booking a guided tour of Colmar and its surroundings will give you the perfect opportunity to see the best of this quaint town. 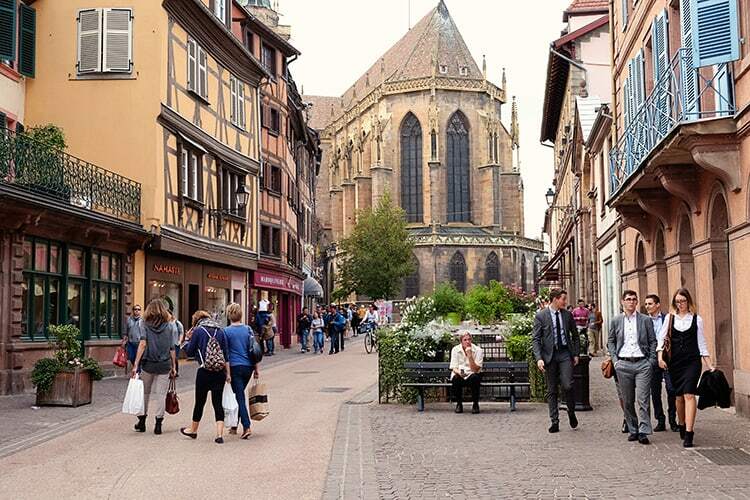 This trip will take you from Colmar all the way to the medieval Château du Haut-Kœnigsbourg. Along the way, you’ll get to stop off in some of the villages and explore their old streets. Admire the beauty of the buildings, taste the impeccably crafted wines, and savor the mouth-watering food available. Children under the age of 5 are unfortunately not allowed on the tour. 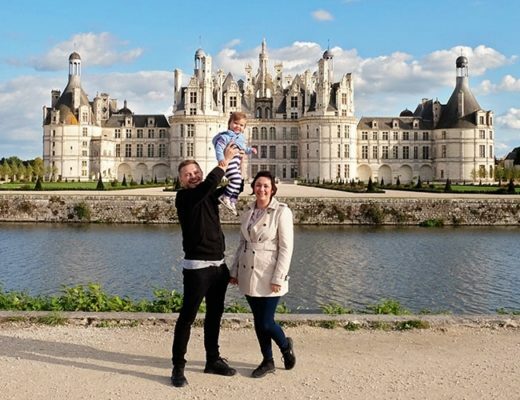 This tour gives the whole family a chance to enjoy some great cheese tasting, a cave tour with wine tasting, and a visit to a working goat farm. 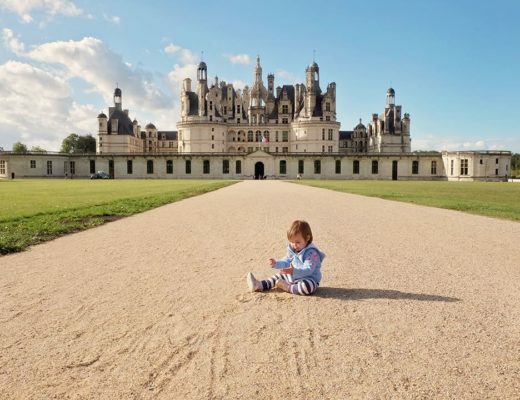 The tour is stroller accessible, and children of all ages can join. Segways are always fun! 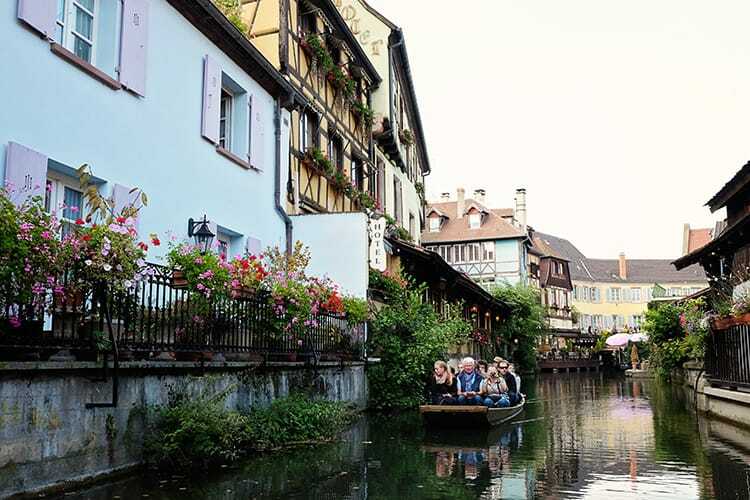 This 2-hour trip will take you around Colmar in a unique and adventurous way. 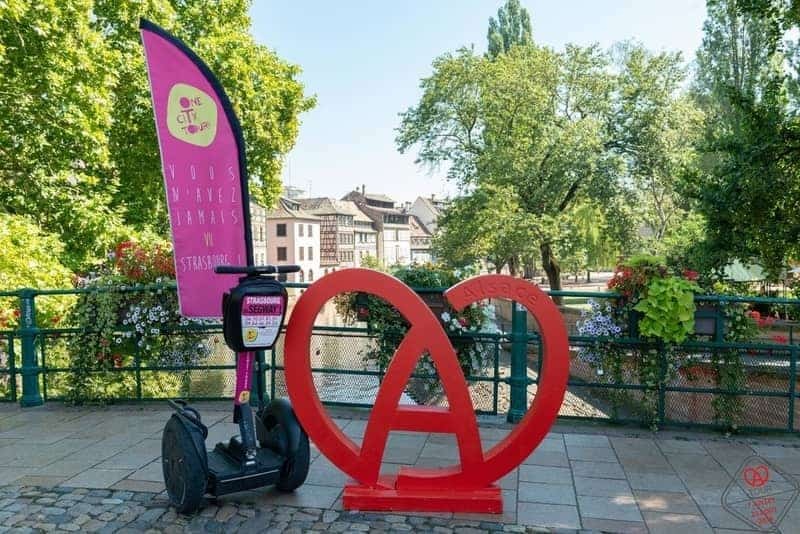 You’ll get kitted out with a helmet and given instructions on how to drive your segway, and then you zoom off with your group! This is something you can enjoy with or without the kids (provided they are heavier than 35kgs). 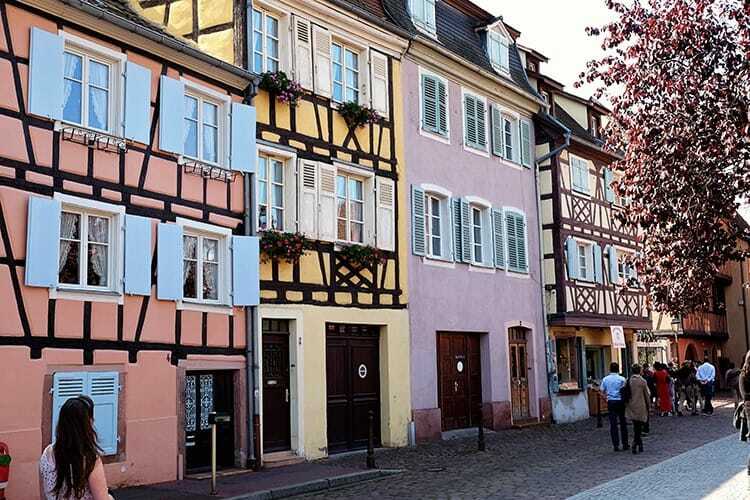 Discovering the gentle Alsatian lifestyle, as presented by Colmar, cannot be complete without a sampling of the Colmar cuisines and wine culture. Different from any other part of France, you’ll also encounter the mouth-watering Alsace pastries. From the Kugelhopf cake (similar to the American Bundt cake), sauerkraut (fermented cabbage served with a variety of meats and boiled potatoes), Choucroute garnie (a speciality of the Alsace region,which is like sauerkraut but cooked in wine), tarte flambèe (Alsatian pizza), foie gras, juicy ham hock, spicy gingerbread to escargots and famous Alsatian wines, you’ll never go wrong if you’re a foodie! Some of our favorite spots and best recommendations for where you can eat are at the historic centers such as Au Pont du Corbeau, the waterside Brenner, the opulent Brasserie Le Thèâtre and too many more to mention! We rounded up 3 of the best hotels on offer, depending on whether you’re hoping to save money, travel in a large group, or get in a luxury Colmar holiday, we’ve got you covered. 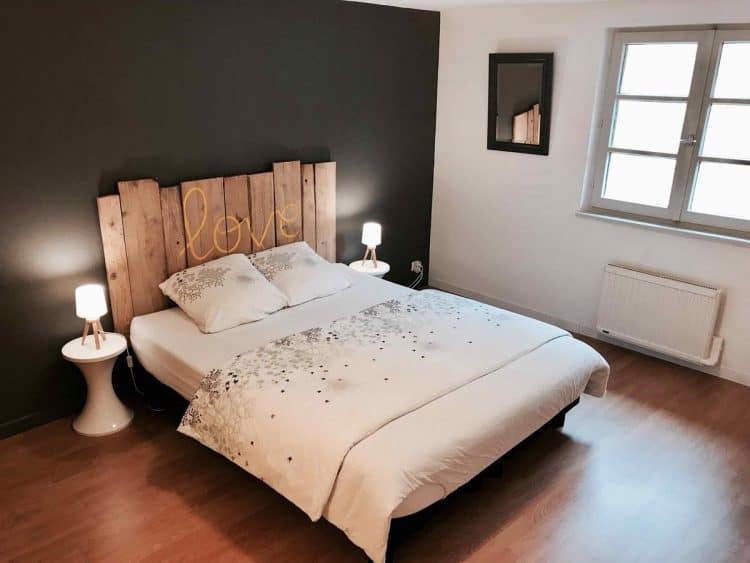 l'Ours de Colmar is a comfy spot to stay in Colmar, only 400m from the city center. The only thing budget about this hotel is the price! The units are all furnished with a TV, self-catering kitchen appliances, and even dishwashers. Some of the bigger units have seating areas as well. Every room is spacious, clean and equipped with all you need for a comfy stay. The MyAlsace apartment provides 2 bedrooms, a kitchen, living area, and a spacious bathroom. It’s perfect for families who need affordable Colmar accommodation. The apartment is bright and colorful outside, and neat but cozy inside. 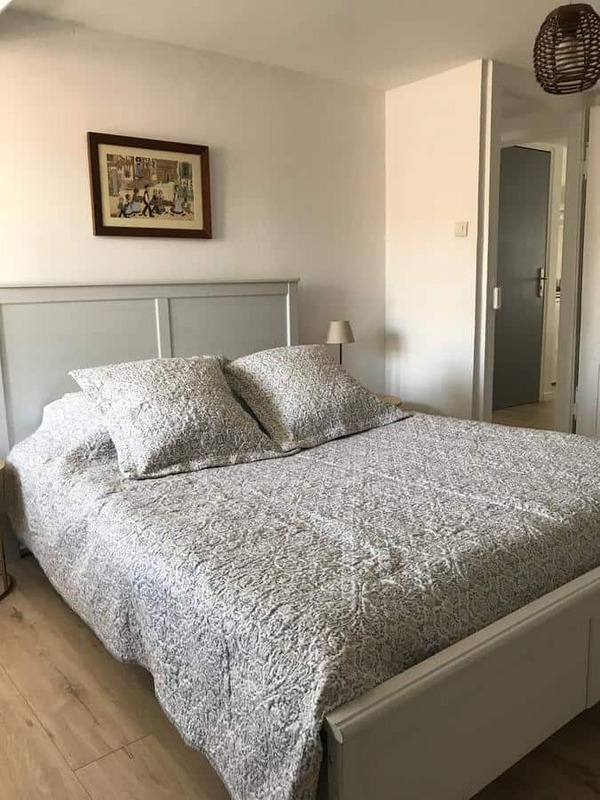 Staying here, you’ll be situated close to the center of Colmar, and will be a short 10-minute walk from Saint Martin’s Church. 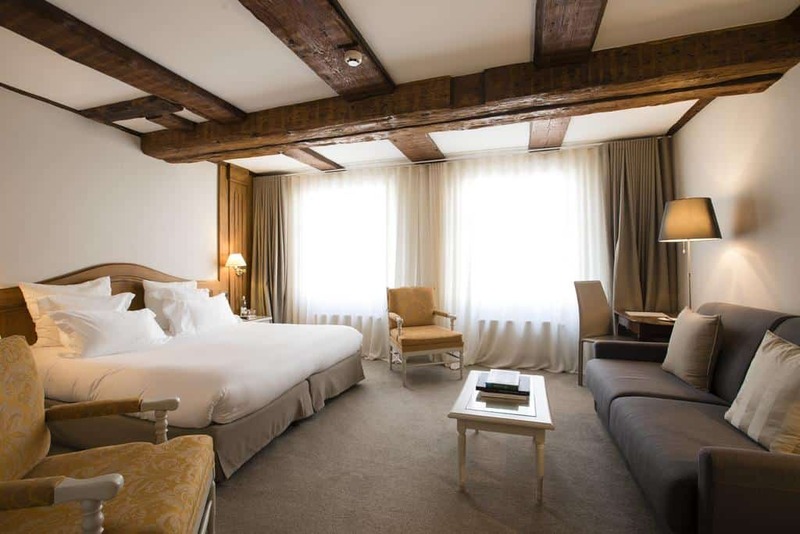 La Maison Des Têtes offers true luxury, for those who are wanting a more pampered visit to Colmar. The hotel is housed inside a gorgeous 17th-century building, and includes an onsite restaurant, drinks lounge and shaded patio for guests to relax. The rooms are tastefully decorated and include air conditioning, your own TV, free WiFi, and a private bathroom. This hotel is often booked out due to its popularity, so if you find it available, it is best to book it ASAP. We love using AirBnb as they are brilliant at offering great family accommodation options as truly affordable prices. AirBnB connects you with homeowners who rent out their homes/apartments to travellers. The little Airbnb that we stayed in Colmar was in a brilliant location. It had lots of space as well as a beautiful kitchen where we could prepare our own meals. 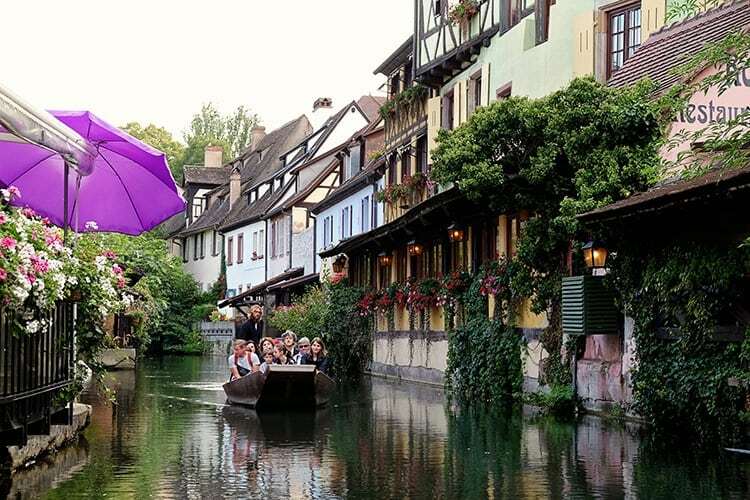 Colmar is a truly magical place and a fairytale-like town in our eyes. This is the place in France that we are planning to settle down for a while one day. 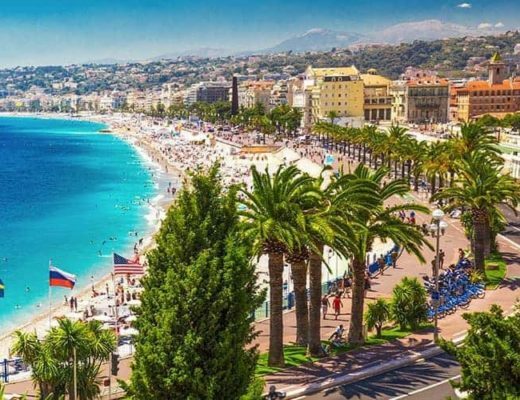 Everything about this place is beautiful, from the colorful buildings, cobblestone streets, to the delicious cuisine in the multitude of restaurants, and so much more! I hope that our guide has helped you to answer all your questions. And if not, please feel free to pop some more in the comment section below. We will try to help as much as we can. Until then, enjoy your travels and have a great time in Colmar!